1 Why use follow us buttons? 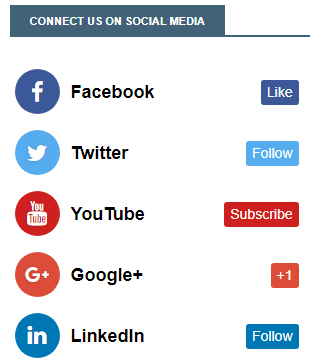 1.1 Ways to add follow us social buttons? Adding follow us or connect us social media buttons to your blog is a “must do” stuff, that every blogger should adapt to their blog or website. If you are new to blogging and looking for tools to grow your social media reach and followers, then you can use it as a social media marketing strategy to grow your blog. In the last 5 years analysis, social media was the 2nd largest source to gain a high amount of visitor/ readers/ followers to your blog, which comes after organic traffic and the best part about this is, it’s totally free of cost. Why use follow us buttons? As I told you above, there as many benefits of using it on your site. Below are some quick pros that you should know before applying it to your blog. Increase your followers/fans in a more faster way. Gain referral traffic/audience to your blog posts. Create Facebook pages and grow your brand. Gain trust and create engagement between you & your readers. Turn your first-time visitors to a lifetime subscriber. You’ll get more benefits after implementing it to your blogger site. Ways to add follow us social buttons? There are mainly two ways by which you can install the social widget on your blog. 2. You can use short scripts from another social media tool provider websites to show follow us buttons on your site. This method can be a little tricky, during the process you might need to change your template codes. Copy the below codes and paste it on your layout page’s HTML gadget. If you’re confused? read the below post. Note: Before pasting the below codes to your blog, change the blue codes into your actual social media account URL. 1. 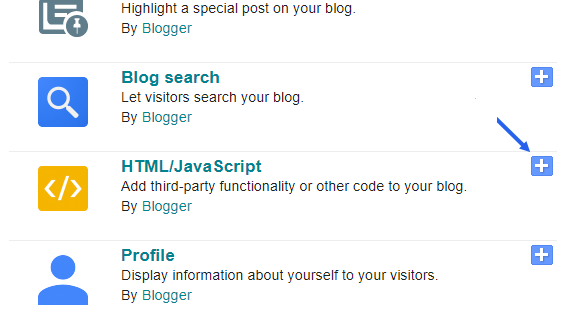 Copy the given codes above and head over to blogger > layout page. 2. 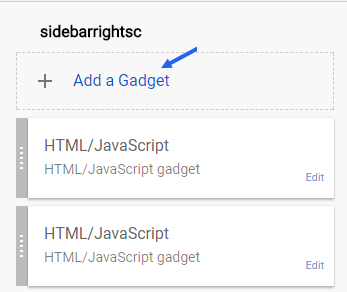 In the sidebars click on add a gadget. 4. 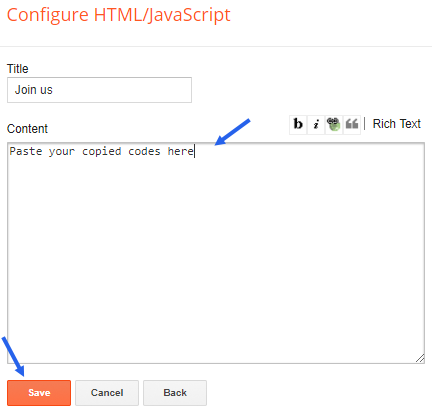 Paste the codes in the content box, add a title and click save. 5. Click save arrangements and you’re done! Adding social networking follow us or join our buttons on your site is a good technique to boost your business. You can easily grow the numbers of subscribers on your blog via this widget. Did this widget work on your blog? let me know in the comment box below and also subscribe us for more latest updates!